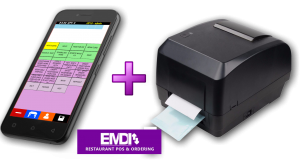 EMDI order taking application is an easy software, a complete solution for ordering, table management and e-catalog for iOS and Android devices, ideal for restaurant, bar, cafes. Download EMDI iOS & Android order taking application from App Store or Google Play and try it for 30 days free! EMDI iOS order taking application – Android order taking application is a simple and at the same time very powerful and easy to use program that you can literally handle with one hand, making waiter’s work easier. Even for installation, you do not need anything special. With a smartphone and a thermal printer connected to your router you’re ready to get started! There is also the ability to create and export reports as well as manage the warehouse for product tracking. The rent is paid via a bank account, credit or debit card and paypal. If the current rent is not paid, the program automatically locks and you can not use it. When money is deposited, the program unlocks. Support and new releases are included in the rental price. The program makes it easy to type products and customization by the customer. It does not include the cost of installation, customization.